High Lawn Farm’s Jersey cows are NOT from the Garden State. 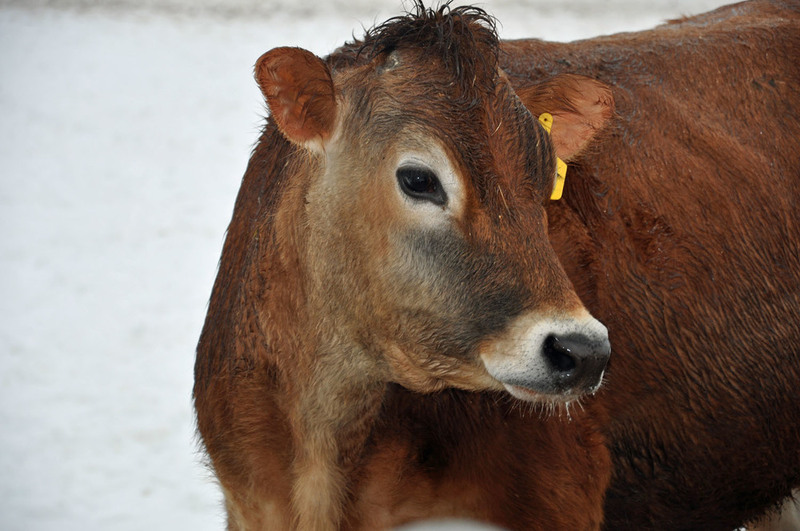 The breed originates from the Isle of Jersey in the English Channel, and they are easily distinguished from other cows because of their beautifully dramatic heads, with large eyes surrounded by contrasting shades of beiges and browns. · Deb Morgan (Executive Chef/ Kripalu) "Our guests love that the milk we provide from High Lawn is so pure and that it comes from a local source." · Dan Smith (Chef/ Owner John Andrews Restaurant) "We use High Lawn milk and cream for making our house-made ricotta, which is really flavorful because of the butter content in their dairy. The ricotta comes out creamy and sweet, and we use it to produce a light, delicate gnocchi." Located on a hill just outside of Lee, High Lawn Farm is small in scale with a staff of 26 and about 400 animals. It’s a family farm rooted deep in the community and the region. The Wilde family is in its 3rd generation of owning the Farm. They started processing milk in 1923, and for decades High Lawn has been a complete dairy farm in the Berkshires – producing, bottling and delivering milk. When Colonel H.G. Wilde and Marjorie Field Wilde inherited ownership of the farm from Mrs. Wilde’s family in 1934, they recognized the value of having Jersey cows and took pride in these heritage cows achieving a high standard of performance, winning recognition from The American Jersey Cattle Club, the National Dairy Shrine and North American Jersey Cheese Awards. They chose Jerseys for the quality of their cream and their reputation as friendly cows. Manager of the Farm, Roberto Laurens, says “The ‘why’ of why High Lawn is here is because of the communities and business support.” He emphasizes the early importance of home delivery for getting rooted in the community, and that the Farm has worked hard to develop longstanding relationships with restaurants, schools and markets. A team of five High Lawn trucks makes local and regional deliveries as far away as Boston. While most of the sales are closer - in Berkshire County and the surrounding region - delivering to Boston, Northampton and Springfield has helped balance out yearly sales. Roberto says High Lawn appreciates the contributions of other dairy farms to the Berkshires, as that reinforces a strong community. The Osofsky family has been milking cows in the Hudson Valley for 70 years with Ronnybrook Farm Dairy, and opened its dairy plant in 1991 in Ancramdale, NY. Hawthorne Valley Farm, a Biodynamic farm in central Columbia County, has been operating for over 40 years. And now, the Leahey family is bringing back dairy production to the Leahey Farm in Lee, with a processing plant to produce bottled milk and frozen yogurt. Guidos, the Berkshire Co-op and Berkshire Organics all carry High Lawn, as do small shops and supermarkets in the region, such as Big Y. “High Lawn doesn’t have a local store because merchants in the area stock the milk, so they help support the community that way. It’s sustainable”, says Beth White, High Lawn’s Business Developer. She is encouraged that “farming is making a comeback. We’re local, so families can visit and we often give school tours. We’re proud to be restoring our buildings to what they were 100 years ago. While the farm is experiencing barn renovations and facilities upgrades, it should all be completed by September.” Visitors to the farm first notice the architecturally-impressive tower on the property, which has become a symbol of the farm. In addition to High Lawn’s popularity with chefs , the Farm delivers to colleges and schools, including Williams College, MIT, Leslie University, Emmanuel College and more. Kripalu and Canyon Ranch also use High Lawn. In the Berkshires, everyone knows about the quality of this 100% Jersey milk.